Summary of today’s show: The country of South Sudan has been in existence for just about one year and still struggles to provide even basic needs for its people. Last year, Scot Landry interviewed Fr. Peter Loro right after independence and now Fr. Loro has come back and sits down with Scot and Fr. Chip Hines to talk about the progress since independence and the many pastoral needs experienced by one of the poorest countries in the world with a population starving for the sacraments. 1st segment: Scot wished his mom a happy birthday today. Fr. Chip Hines also said he was asked by Cardinal Seán to become the pastor of St. Joseph in Medford. He broke the news to his parishes in Wrentham and Plainville this past weekend. They discussed how a priest says yes to a bishop unless there’s a very important reason. Fr. Chip said as hard it is, it’s a time of reflection with the people he’s leaving. It’s difficult because you become family as their priest. Scot noted that St. Joseph’s is the parish that Fr. Chip was baptized in. His grandparents and parents were married there. The parish also has a school and Fr. Chip is very interested in working with a parish school. Scot noted his own brother just transferred from one parish to another in the Diocese of Fall River. He asked what’s going through Fr. Chip’s mind. He said his parish staff is helping him with logistics, pack all his stuff, clean up all his paperwork, see what he needs in his new parish. He will start in his new parish on August 1. Scot said Fr. McLaughlin that Fr. Chip is replacing in Medford was in the parish for 35 years, 25 as pastor. He said perhaps a third or more of the parish have never known a different pastor. Fr. Chip said it’s a great opportunity to offer some different or new approaches to being a pastor. Today’s guest is Fr. Peter Loro, who will talk about the challenges for the Church in South Sudan, Africa. He was on the show last summer by phone to talk about the country right after its independence from Sudan. He will update us on the first year of the country and the current state of the Church there. 2nd segment: Scot welcomed Fr. Peter Loro of the Archdiocese of Juba to the show. Scot said Fr. Peter has just completed a decree in canon law in Rome. Fr. Peter said he was sent to study in Rome three years ago and completed those studies last month. He’d been invited at the time to come to Boston to participate in the mission appeals in Boston by the Pontifical Mission Society here. Then he will return to South Sudan to take up his new assignment at home. Scot said Fr. Peter will speak at six or seven parishes throughout the Archdiocese. Fr. Peter said the situation in South Sudan is challenging because before independence they went through more than two decades of war with the north. Now that peace has come there have been many challenges. For instance, Juba is filled with displaced people returning to the country from abroad and from the countryside. The Church has been challenged to provide for the spiritual and physical needs for these people. This is why they have turned to the universal Church. Fr. Peter said the Pontifical Mission Society is more than just a charity providing handouts of money and goods. First and foremost, their work is to bring the Good News of Jesus Christ to the people. He said behind the donations the people of Boston may give is the intention to bring the Gospel of Jesus. Scot noted most people are familiar with the Society for the Propagation of the Faith, which is just one of four Pontifical Mission Societies. Another is the Society of St. Peter the Apostle. They provided for Fr. Peter’s education in canon law in Rome. Fr. Peter said the society has done great work in forming priests. They don’t just pay for priests to be educated in Rome, but also continue to assist them when they return to their home dioceses. Whatever donation people can give to this office, they will participate in the formation of young men who will be very useful in supporting the Church in South Sudan. The St. Peter Society is supporting the seminary in Juba which is the lifeblood and future of the Church there. Fr. Chip asked the difference between Sudan and South Sudan and why the need to establish the new country. Fr. Peter said Sudan received independence from the British in 1956. They handed power to the northern Sudanese on whom most of the resources had been concentrated. Given that situation, the people of southern Sudan asked to be given their independence, rather than be forced into a quickie marriage that will break up eventually. Right away, they had their first civil war in opposition to that first decision. That war continued until 1972. Right after that peace agreement, it was abrogated by the northern Sudanese president. From 1972 to 1983, the people of southern Sudan prospered a little and by 1983 they wanted more independence. The people of southern Sudan were second-class citizens. The northern Sudanese are mainly Muslim Arabs versus the Christian Africans. The civil war started in 1983 and lasted until 2005. That peace agreement included a requirement that after 6 years the people of southern Sudan were to be given a choice for independence or unity. That led to a January 2011 referendum on the issue and 98.9% of people voted for separation. They celebrated their independence on July 9, 2011. If you go to Sudan today in the north, it is Islamic. It is a desert climate. In southern Sudan, it is Christian, African, and more temperate climate. They were historically different people forced together artificially by the British empire. The problems were political, religious, and cultural. Fr. Peter said they are bordered by Kenya and Uganda to the south, Ethiopia to the east, Central African Republic to the west. 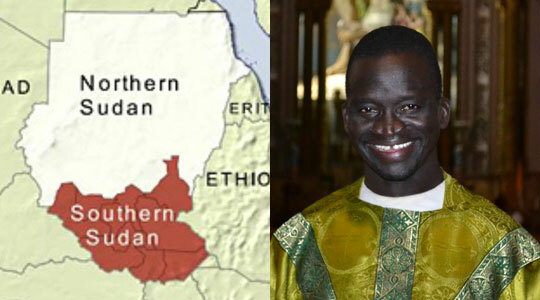 There are nine dioceses in the whole of Sudan, north and south. Now they have seven dioceses in South Sudan, including the Archdiocese of Juba, which is the capital. The majority of the Christians are Catholic, followed by Anglicans. The majority of the people have access to weekly Mass, in cities or villages. In some of the outlying areas, including Fr. Peter’s former parish of St. Thomas, the parishes don’t have churches. Instead they celebrate Mass outside, often under the trees. Fr. Peter didn’t have a rectory when he first went to his parish. They built a grass hut where he lived for three years. He said it was a good shelter, not ramshackle at all. Fr. Chip asked how many baptisms Fr. Peter would do on a general Sunday. Fr. Peter said he had to cover 16 villages in his parish and visited them on a monthly basis. The people would come in the hundreds and he would baptize the children. The people didn’t come to the parish center because of the danger of robbers and land mines which made travel dangerous. He said he would anoint so many people his arm would grow tired. He might baptize 100 children at a time. The people are hungry for the sacraments. It isn’t easy, but it is rewarding. Fr. Peter said he would stay for a week at a time in the villages. When Fr. Peter isn’t in the villages, he has catechists that he has trained. He would bring them together and show them how to teach the faith to the people. Fr. Peter said they have many materials in their native languages, including the Bible. the basic parts of the Catechism have also been translated. Scot asked what kind of money the parish of St. Thomas had and where it came from. Fr. Peter said the people of the parish want to help with the programs of the parish, but they look to him as a provider of the material needs they don’t have. They look to the Church to bring in international aid to the village. Fr. Peter said the Church there appealed to the Pontifical Mission Societies to provide a little money to create local projects to rise money. For instance, they built a ferryboat crossing the Nile River to raise money, which among other things helped them build a school. Fr. Peter said it’s important to have a school because you have to preach Jesus but also teach them how to preach Jesus to others themselves. Fr. Chip asked how many priests in the Archdiocese. Fr. Peter said there are 54 priests, plus the archbishop. Not all of the priests are in parishes. Some work in institutions, but those who work in parishes are paired together. There is a major seminary for all of South Sudan. While some studies still go on in the seminary in Khartoum in the north, they will have to transfer soon because the northern government treats the students as foreigners who need permits to study there. Fr. Peter said when he was in Juba last September they opened a new parish. The archbishop celebrated the Mass under threes. Fr. Peter said a parish should have a church, a place for the pastor to live, a basic primary school for the children, a health clinic and dispensary. Today, to get malaria medicine, people have to walk sometimes 55 miles to Juba and some die on the road. Fr. Peter said these basic needs would be a huge contribution to the life of the people. Scot asked what people do in south Sudan for jobs. Fr. Peter said most people live on subsistence agriculture. They grow just enough to feed themselves and to buy medicine or pay school tuition comes out of that. Fr. Peter said before the peace agreement, most kids didn’t even reach secondary school, whether due to lack of schools or because of insecurity. Now there is the possibility with new roads that people could even get to the towns for university study. Fr. Peter said war had scattered the people from their homes to other African nations or even to the rest of the world. In a way that was a blessing because many people were able to get higher education, even college degrees, while displaced and are now returning to contribute to the country. Fr. Peter said the United Nations is providing some aid through non-governmental organizations, which Fr. Peter said often have selfish ends. He said a number of NGOs did help to provide simple education and healthcare and food and shelter. Scot said the Pontifical Mission Societies help the Church there, but also Catholic Relief Services helps as well. Fr. Peter said CRS has helped southern Sudan for many years. Fr. Peter said they have particularly helped in education, building schools. They also provided healthcare and food and shelter. Other organizations include Aid to the Church in Need. But outside groups always want to manage their programs themselves as opposed to letting the local leaders prioritize their needs. Scot asked Fr. Peter what he thinks the people of the Archdiocese of Boston can help with. Fr. Peter said he hopes to support the pastoral needs of priests to reach the people. He means mobility. They don’t have cars in most cases and when they do it’s very old. Most walk on foot, which wastes a lot of time. He said people also look to the Church for food, shelter, medical services. All of this takes money and so hopes all of this can be supported. Scot recalled Fr. Paul O’Brien in Lawrence saying that the kids in the local Catholic school do better in school because they care for the whole person and the kids study better because they aren’t hungry or aren’t sick. Fr. Peter said the people need care for the whole person, the body and soul. Christ came to save us body and soul. Scot said if people wanted to help, the Catholic media secretariat in Boston will help create a website for Fr. Peter at which people can make donations.